Israeli authorities have stormed a hospital in Jerusalem for the third constitutive day, deploying rubber bullets and smoke grenades, in order to gain access to the medical records of Palestinians allegedly wounded in clashes with police. Israeli police officers raided the Bagthamha Makassed Hospital in the Jerusalem neighborhood of al-Tur using rubber bullets, smoke grenades and sound bombs on Thursday. Authorities were trying to find a medical record belonging to a 15-year-old Palestinian boy, who was allegedly hit with a .22 caliber Ruger bullet during a recent clash with Israeli security forces, Haaretz reports. Thursday’s raid happened as hospital staff participated in a pause of solidarity with the support of the International Committee of the Red Cross (ICRC). Scared of being injured in the raid, people ran for their lives away from the hospital. 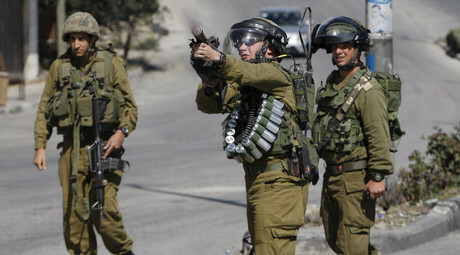 While in the hospital, according to reports, Israeli forces harassed and insulted the patients. Hospital officials say the police have been raiding the medical facility for the third day running in order to find and arrest Palestinians suspected of involvement in clashes with the Israelis. Israeli authorities say the hospital unlawfully failed to report those injured by gunfire. No arrests were made during Thursday’s raid, according to hospital officials. However police said the files were found and the teenager in question will be indicted. Dr. Ali Al-Husseini, head of the hospital, told Maan news agency that the raids took place because doctors refused to share patients’ records with the Israeli authorities in order to protect patients’ privacy. “It is not our job to give any information about anyone [who] comes to hospital or to take any personal information. Our job is only to help them and provide them with medical treatment,” al-Husseini said. Despite this, the Israelis continue to threaten and pressure the hospital staff to provide admissions and reasons for hospitalization. The head of the hospital accused the Israeli authorities of “desecrating” the medical facility as he appealed for help to the international community. Israeli police officers looked for the medical report of a 16-year-old patient, who was admitted some days ago. The boy had a prescription from the hospital which led them to the medical center, the hospital’s director told RT’s Paula Slier. “They didn’t need to come with forty soldiers and a lot of weapons. This is a hospital and two people is enough”, he said. In his opinion Israelis do not have the right to enter the hospital, although they had court orders. “We are carrying out operations during day and night in order to spot those attackers and people who were part of the recent events,” Micky Rosenfeld, spokesman for the Israeli police told RT. “There’s nothing special going on,” he concluded. The first raid on the hospital took place this Tuesday. 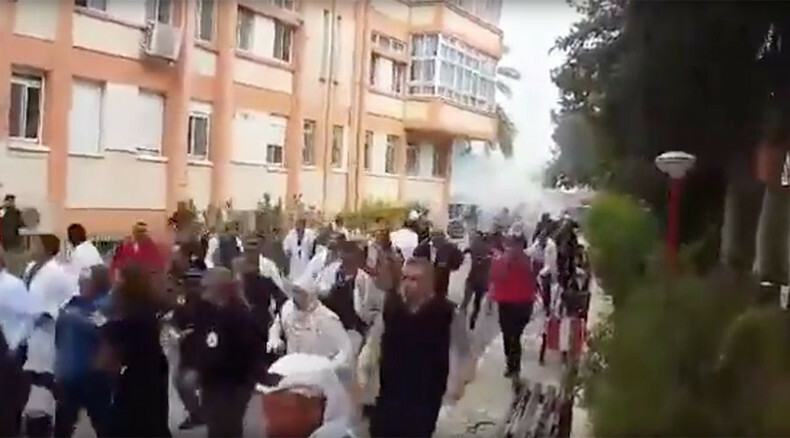 On Wednesday the 250-bed hospital was raided for the second time, when Israeli security forces accused the medical staff of collaborating with rioters and harboring the injured from Israeli justice.